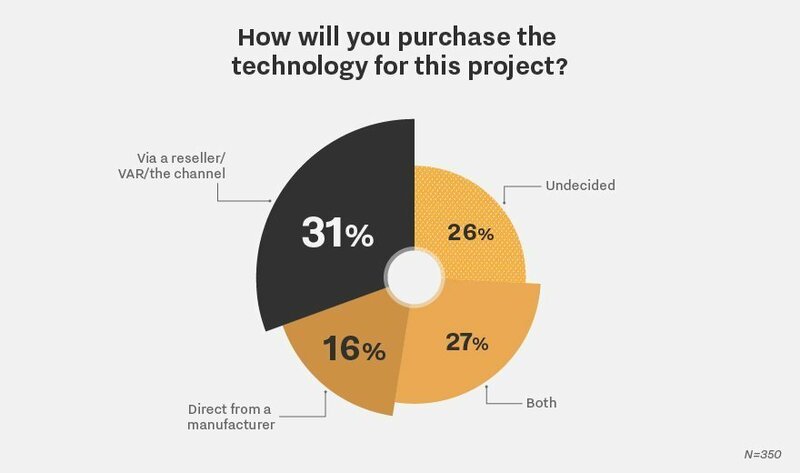 Thirty-one percent of survey respondents said they will purchase the technology for their unified communication project through a channel partner, while 27% said they would purchase it from both a partner and manufacturer. Only 17% said they would buy the technology from a manufacturer alone. How a customer decides to purchase technologies for its UC project will always depend on several factors, said Stephen Tong, senior director of infrastructure services at Avanade. Since unified communications is a "solution" and not a product, it requires integration, management, planning, and, depending on how big the customer is, interoperability with what it already has deployed. "If you're the kind of business that can do all of that ... and you can handle the change management, then you're likely going to want to take on [the UC project] yourself," Tong said. He doesn't see many companies overseeing UC projects on their own, however, because UC is specialized and involves many technologies. But channel partners who want to step in and offer technical expertise need to appreciate that unified communications is about more than the technology. There's a human side to unified communications to appreciate, as well. "One of the dirty secrets of this business is ... the first thing you need to be good at is you need to really love people. At the end of the day, it's all about people. You have to be good at technology, but it is the technology most exposed to end users -- much more so than anything you traditionally deal with in the IT world." Tips on selling managed communication services. Workspace collaboration: What are the opportunities for Skype for Business? Read about the top five UC trends of 2016. What unified communications trends are you following?